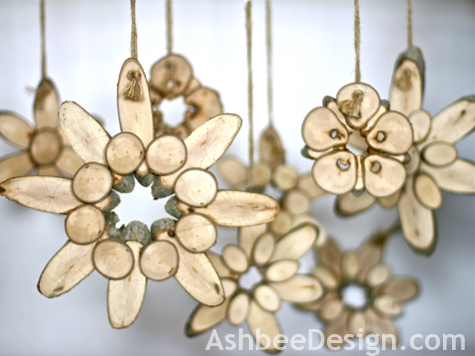 I recently shared with you my wood slice flowers that I used in the rustic screen hiding the gas grill. When I made those they needed to be small to fit the location but as I was creating them I knew there were bigger possibilities. This past weekend I finally found the time to create some large variations. 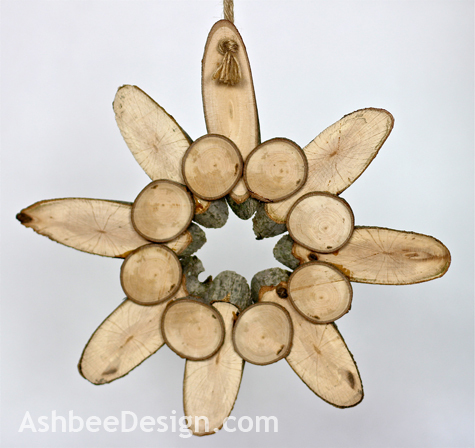 I cut wooden sicks into thin slices at a variety of angles and then combined the circles and various ovals into star burst flowers. The combinations and possibilities are endless. This example is ovals and circles with an open center. Here is a composition of long ovals, short ovals and a round center. While I was cutting the slices I started out thinking I would only use the straight, clean pieces of the branch but then I sliced into a knotty area and found the resulting wood slices interesting in a different way. 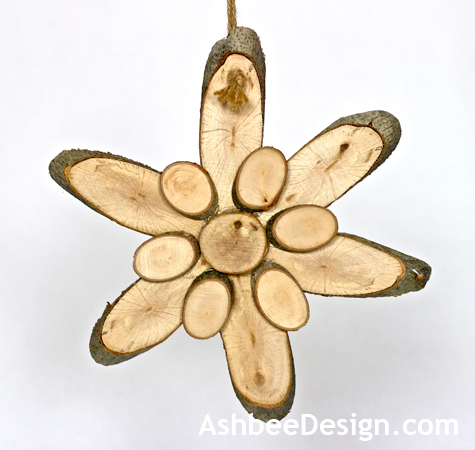 The following flower is made from knotty wood slices. The process, which I'll detailed in my post tomorrow, was quick and easy but did require use of a band saw. I did include variations from the process for the smaller flowers because of things learned. I made a collection of designs in a short period of time. 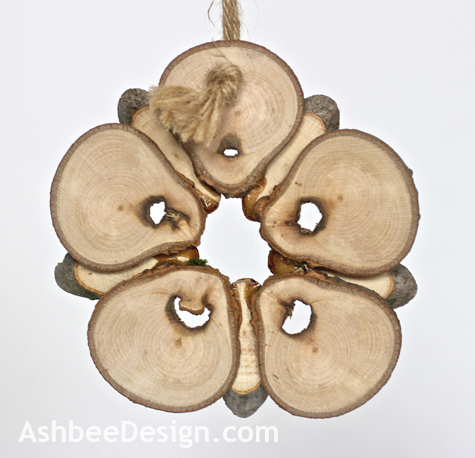 I was creating them for the tree branch ladder I created for my front entry area. I have been blogging regularly about the various arrangements displayed in the ladder. The Queen Anne's Lace of last week was past its prime. So I was designing flowers specifically sized for this location. They stand out beautifully against the blue/green stain on the house. Update: The Tutorial is posted. Click here to view the step by step process. Amazing! What a great idea! Thanks for sharing! Thanks Carrie. I like them and they were easy! Came over from DIY. You are super creative. I do not think I have ever seen anything quite as beautiful as these floral designs. Very unique! Thanks Donna. Try them yourself if you have access to wooden branches. There are endless combinations. AMAZING!!!!!! 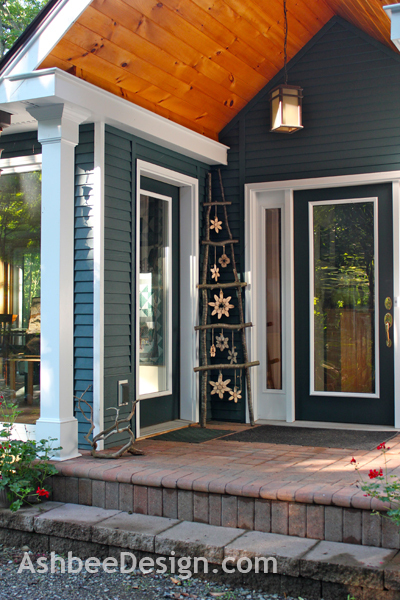 Love the look of them on your wooden ladder!! Thanks, Christine. Yeah, the ladder has been a creative inspiration. Easy to change every 2 weeks or so and so many possibilities. Welcome Kathy and enjoy. Lots to see here for sure! Thanks Jeanette, I got tired of always picking flowers for the ladder display and watering them. This should be good for a few weeks and no watering required! So beautiful and creative!! Thanks for linking up at Romance on a dime's TIOT party! You are so creative. I loved your other wood slice flowers but these are amazing. I think these would make wonderful Christmas tree ornaments as well. Frugal and "green"--love it! These are lovely and so creative! Thank you for sharing your lovely project at Potpourri Friday! 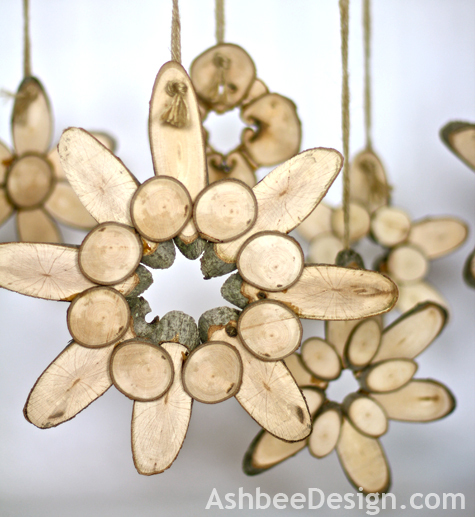 Thanks everyone for your comments about the wood slice flowers. I have had a lot of company this week and everyone has commented on the collection of them hanging from the ladder near my main entry. Very well received!